For example, you experience something--perhaps a bit discomforting or frustrating. Then, you examine, analyze, and digest the experience through your personal lens. (A person's lens is how they see the world. And, it is based on our self-created beliefs systems, values, other life experiences that shape our beliefs, and perceptions.) It's through that experience that you achieve personal growth and learning. That's why instructors assign reflective writing. But before writing can take place, you have to understand yourself and the experience in order to make sense of the situation. Sometimes, you may not be able to make sense of what happened. With time, though, you can understand how that situation affected you and what you learned from it. Reflective writing helps you understand yourself better and how you fit into your world. It also helps you become more refined in your thinking and understanding of others ... especially others who have different views than you. Reflective writing is often combined with study abroad programs to help students understand another culture with different belief systems, as it helps students connect and communicate with others as a whole both at home and while abroad. But, it is also good for every-day contemplation and learning during life's transitions, such as starting a new job, moving, or life changing family events, i.e. death, divorce, or marriage (random order here, of course :-) ). Where is reflective writing most appropriate? Reflective writing happens in many places you may not realize. For example, businesses have their own way of reflective writing. Some create reflective reports about a particular product or a marketing or sales campaign to inform stakeholders of its success or failure in order to improve or make decisions. Often, teachers will write reflectively about the successes and failures of a lesson, quarter, semester, or school year in order to improve their teaching style and methods for the next class. It is a tool people use to become better professionally, personally, and spiritually year after year. And, that's why it's so important--and why those in academia usually assign such essays at some point in a student's learning journey. When is the best time to write reflectively? The best time to write reflectively is one to 24 hours after the event, situation, or excursion took place. It is in those critical hours that your memory is best, and you begin to make serious connections between what happened and what you believe, perceive, and observe. This is the time for initial thoughts, impressions, and details you may otherwise forget. However, give yourself a few days--perhaps even a week--after the event to turn those first thoughts into a rough first draft. This helps you make sense of and understand the experience for personal and professional development. Your mind is clearer and no longer clouded by the emotions you felt at the time. It is in reflecting on the events and/or situation that we truly understand what happened and our own part in it. This is how we understand ourselves and the world around us on a deeper level. In doing so, makes us not only appreciate others or a difficult situation we experience, but we learn to have more empathy. For others. For other cultures. And, for ourselves. How do you write a reflection? Once you've experienced something, written down the details in a journal, diary, or other notebook and given yourself a few days to a week to reflect--after the initial discomfort recedes. Then it's time to compose your official writing reflection rough draft. Look over your initial journal, diary, or notebook notes about the event. Then, begin by just writing whatever comes to mind. And, write it down fast. Sometimes once you begin to write, more comes to mind. You have epiphanies and realizations that you may not have thought about until your pen or pencil hit the paper. Get all those ideas out ... then let it sit. Or, "sleep on it," as they say. What I mean is put your draft aside for a few hours (at least) or, preferably, over night. Have you ever had a song stuck in your head, but when you try to sing it to someone aloud the person has no idea what song you're singing? You have to sing it a time or two--or three, and then finally the person says, "Yeah, I know that song. Thats' (such and such)." YES! Finally, now they can share your pain and have the same song stuck in their head! That's what you have to do with your writing too ... you have to make it so clear that the reader deeply understands all you have to say--paint the picture for him or her. Make the reader experience what happened to you and understand your interpretation of it, so that it can now stick in their head, as if they experienced it themselves. You may realize that some of your writing sounds angry or frustrated. Good writers will show readers their feelings, so that they too will feel the frustrations and anger. So, you do want that. However, you don't want the reader to think you are angry at him or her. So, besides revising for typos and clarity of meaning, make sure your tone is directed in the right place. You can be frustrated, angry, sad, happy, or whatever, but focus on the feeling. After all, it was a feeling you felt as you experienced an event or situation. Focusing on the feeling (instead of placing blame) is called being objective. (Of course, there are always exceptions to the rules.) Good reflective writing is a way of thinking objectively about whatever it is you experienced. Once you've checked for clarity and tone, then read your essay aloud to yourself to catch any last typos. It is also good to have one person you trust read the piece to catch typos you self-edited out when you yourself read the essay. I've put together a few examples of reflective writing essays. That way you can see the difference between excellent reflective writing and poor reflective writing. To make it clear, you should be able to see how each is quite different from the other. Here's the ideal way to write reflectively. It's about the writer's experience seeing the Thingstatte amphitheater during a study abroad experience. After almost two hours of walking, my group of four turned to a pair, Sage and me. We didn’t have knee problems or back problems or any number of other excuses the two other girls gave for giving up … quitting on our quest to find the old monastery at the top of Heidelberg Hill, as we called it. But that’s okay, we decided. And, we continued on. It is on this day I realized an important life lesson: the time when you want to quit is really the time to crank it up a notch and press forward … because something incredible is right around the corner. As the others departed, we blazed our own trail through the trees and mud. Up, up, up--straight up the steep hill until we found yet another path. Finding these paths became addicting. Curiosity took over and our legs sprang at the opportunity to walk down another trail. We didn’t know what we’d find but figured we’d eventually find the monastery. And we did. Shortly after the others started back, we walked along the first paved path … and saw something recognizable: a beer garden. In the distance, there was a building, and I asked Sage thought we’d have enough time to catch up with the others if we continued ahead. She thought so--and we pressed on. This “building” ended up being the greatest gift of the day--may be even of the entire trip. We stood in the doorway of an immense stage. Rows and rows of stairs seemed to continue on, may be two or three stories high. People walked and climbed up and down them. Bikers carried their mountain bikes and focused on the steps, but a few gingerly rode down those stairs! We learned later that this was one of several amphitheaters created by Hitler’s Nazi party for the propaganda rallies held before World War II. Students from the University of Heidelberg volunteered to build the structure during the early 1930s, and it’s spectacular! Anywhere you sit, you can hear the person on stage speaking in normal volume. Of course, we tested the theory--more than once. And, we took several pictures of us in mid-jump on the stage with the rows of stairs as the backdrop. At the top of all those stairs lay the ruins of the old monastery. Sage and I spent some time walking the ruins, but it was nothing compared to the immensity of the Thingstatte. Too many people made it difficult to meditate and the ground was too wet for yoga… so our plan for a moment of solitude never occurred. And, that’s okay. Amazing things happen when you least expect them. Today’s excursion was a prime example of that. The plan this morning (I thought) involved an hour walk on Philosopher’s Weg, up to the first tower where we thought there was a monastery that would be perfect for a contemplative few minutes of solitude or yoga. However, I had no idea what awaited me at the very top of the hill… the Thingstatte. The moment I saw the beautiful architecture I thought about the times during the walk that I doubted we would ever find the monastery. I wondered if I was understanding the German correctly and if the group would be angry if I led them in the wrong direction. Instead, I followed my heart, never gave up, and the road least taken ended up becoming the sweetest. If I had given up and left with the other girls, I’d have missed out on something great. That was the take-home lesson today … when things are most confusing, most unsure, and most tempting to give up, pressing forward will bring you to some place even better than you originally planned. Tourism. (2013). “Thingstatte.” Retrieved from TourismHeidelberg.com. Altlas Absura. (2012). Heidelberg Thingstatte. Retrieved from Atlasobscura.com. *References are not standard APA format. See the Publication Manual for APA for more details on citations. Or, the Purdue Owl for more information on APA or other citation formats. This is the type of reflective writing I typically see as an instructor. The example is a good rough draft of thoughts you might write immediately following an activity, event, or situation, but it is not reflective writing. It is simply the "play-by-play," as I call it, of what happened on a particular day. (Similar to a diary entry people write to document events.) There is a comment at the end that is reflective in nature, but the thought is not developed enough nor is the language appropriate to make this a reflective writing piece. That along with the writing itself means this essay needs much work for it to become a reflective essay. Today I went to the Thingstatte. It was really cool, but my friends left the group. Yeah, I know. Bummer, huh. I decided to keep going up the trails with this girl, Sage. She was fit and didn’t give a bunch of excuses like having back problems and stuff like the other girls. So, we kept finding these trails. I mean we’d walk a little bit then find another trail and take that trail up a little more. Before we knew it, we landed on a beer garden. I don’t know who would put a beer garden way at the top of this HUGE hill, but they did. May be people got thirsty or something? At 2:00, we decided that we had enough time to continue up the road. At least it was paved, because the other roads weren’t and my shoes were pretty muddy. I was really excited to find a building not too far from the beer garden. So we decided to walk to it and check it out. When we got there, there were all these steps you could go up. When you first enter the door you are on the stage, but to get to the monastery (where we really were planning to go) you had to go up about 150 steps. 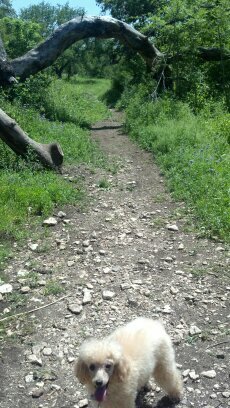 We weren’t scared of steps after all the hill climbing we just did through the mud, so we went up them. And there was the monastery. I was so happy to have seen it, but it wasn’t as big as the Thingstatte. Even though I didn’t know about the Thingstatte being up there, it ended up being much more exciting than seeing the monastery. In the end, I’m really happy we left the other girls to find the monastery and found the Thingstatte too. After we looked at the Thingstatte and monastery we had to walk fast to find our other two friends. We knew they would be walking slowly because of all their back and knee problems, or whatever it was they had. But, they were probably already close to the monkey bridge, or the old bridge. We were having lunch at the Thai restaurant right across from the monkey statue on the monkey bridge. We didn’t want them to think we forgot and wouldn’t meet them. We found them about an hour later, right at the bridge we caught up to them. It was almost 3:00, but we decided to have lunch anyway. I had a tofu stir-fry with these weird pea or oversized capers. The pea, caper things tasted weird and none of us like them. One of the girls refused to try them. I really liked the fried spring rolls. They were vegetarian and cooked to perfection. I think the thing I learned today from all the walking and viewing of the Thingstatte and eating Thai food is that sometimes you find things that you least expect and those things are better than what you originally went out to visit. "But, I can't write like that? Or, think that way?" Reflective writing, like all types of writing, takes work. It takes good thinking to make good writing. So, the first step after experiencing something is to think about that experience. Think about it in many other ways and from many other perspectives. A good explanation of how to do this is in my How to Write a Reflection page. There, I walk you through the thinking process. The idea is to look at what you learned from an experience and think about it in a deeper way. And, to make other connections to it. That's what reflective writing is about. What did you learn, what's the deeper meaning in that learning, and how does and can it connect to other things in life--or in your life. Then ... you have to put that on paper. (Sigh.) And, go through the writing process steps.